Alzheimer’s. Dementia. The words are used interchangeably, but there is a difference and it’s worth knowing. Dementia is an umbrella term under which Alzheimer’s — the most common type of dementia — falls. It is not a disease; rather, the term dementia speaks in a general way to memory loss and changes in cognitive abilities that are serious enough to impact day-to-day life. Alzheimer’s disease is one of the specific types of dementia that exist. How common is Alzheimer’s? The Alzheimer’s Association says it accounts for 60 to 80 percent of all cases of dementia. Memory loss is the symptom that is most commonly associated with dementia or Alzheimer’s, but it’s not the only one. Language is affected. Visuospatial function (that’s the ability to correctly judge the position of objects, to read a map or road signs, etc.) is affected, as is executive function (the ability to reason, focus on a task, solve problems or plan). These symptoms together contribute to cognitive decline and disrupt daily life. If you have concerns about a loved one but do not have a diagnosis of dementia yet, set an appointment with a medical professional immediately. Your mother often forgets where she put her keys, but that doesn’t necessarily mean she has dementia. Some medical conditions can cause dementia-like symptoms (and in most cases, the onset of these symptoms is extremely sudden), like urinary tract infections (UTIs), which are quite common among older adults. UTI can be easily treated and reverse the symptoms. Depression, drug interactions, excessive alcohol use, vitamin deficiencies and thyroid problems can also cause dementia-like symptoms. There are so many types of dementia that getting an accurate diagnosis can be quite difficult; however, since the different types of dementia present in different ways, understanding the specific type your loved one has is vital for future caregiving decisions. For example, a person diagnosed with Parkinson's dementia will be dealing not only with memory loss, but also with gait (i.e., the "Parkinson's shuffle") and balance issues, as well as vision issues, like a lack of spatial awareness or depth perception. This will make safe mobility nearly impossible without assistance. A person with Parkinson's dementia will probably fall more often than someone with Alzheimer's. As the tremors of Parkinson's intensify, basic daily tasks will become difficult, whereas many people with Alzheimer's maintain physical abilities well after the cognitive decline begins. As Alzheimer’s and other dementias (sometimes referred to as ADRD, Alzheimer’s Disease and Related Disorders) are on the rise, the number of care options available have increased accordingly. Today, there are senior living communities (assisted living, personal care homes, etc.) with wings dedicated specifically to Alzheimer's and dementia care. There are stand-alone memory care communities. There are adult day facilities that offer specialized care for people with dementia or Alzheimer's. Nursing homes provide dementia care. Hospice care for people with Alzheimer's and dementia is available. 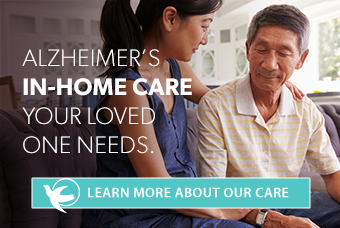 In fact, Medicare offers a home health hospice benefit for people with Alzheimer's. But for the many caregivers who wish to keep their loved ones in comfortable, familiar surroundings for as long as possible, home care services—be it medical or companion care, or a combination of the two — is an ideal option. And because your loved one will receive one-on-one care when you opt for in-home care, it is a truly personalized level of care. What Type of Alzheimer’s or Dementia Care is Best? Any caregiving journey is unpredictable, but adding a diagnosis of dementia or Alzheimer’s takes unpredictability to the next level. Whether you’re in the earliest stages of caring for someone recently diagnosed or still seeking a diagnosis, knowing your options is the best way to be prepared. As symptoms progress, a professional caregiver will be critical to helping your loved one remain comfortable, safe and happy at home. And a critical part of that knowledge is being able to recognize what superior Alzheimer’s or dementia care should look like. All care providers — including in-home, nursing homes, adult day centers, etc. — should strive to be person-centered, and involve the family caregiver to seek new and better ways of supporting seniors without limiting independence. Here is common home care scenario to consider: A family caregiver approaches an agency because Mom needs help with bathing, dressing and her personal hygiene. If Mom needs help with these tasks because she just had a hip replacement, the agency will assign a caregiver based on that physical need and limitation. But if Mom needs help with these daily tasks because she is losing cognitive ability and balance due to Parkinson’s dementia, the care provider will need to have an awareness of potential vision and gait issues and how they will impact safe, comfortable bathing. The professional caregiver will also have to anticipate the possibility that these intimate care tasks will be upsetting based on the individual’s level of cognition (i.e., who is this stranger and why is she asking me to get into the shower?). No matter what type of care you choose, your involvement as the point of care is paramount throughout the entire process. You are the best advocate for your loved one. You are the best person to communicate your loved one's needs as dementia can rob them the ability to speak for themselves. But you’re also facing an uphill battle, one that can unintentionally affect the care recipient. Be mindful of this, and seek respite when you need it.